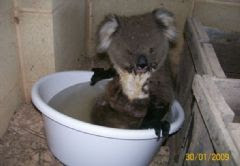 Koala cooling off in a bucket! Australia’s Bureau of Meteorology (BoM) has confirmed that 2009 ends Australia’s hottest decade on record. And 2009 was Australia’s second hottest year on record. Melbourne recorded its maximum temperature on record, 46.6°C and the State’s record maximum temperature of 48.8°C at Hopetoun. August 2009 was the warmest on record with an unusual winter time heatwave when eight consecutive days of temperatures hit over 35°C. In Australia, each decade since the 1940s has been warmer than the preceding decade. This suggests an apparent shift in Australia’s climate from one characterised by natural variability to one increasingly characterised also by a trend to warmer temperatures.